I love sandwiches made with any kind of shellfish. This is a Rachael Ray recipe. Run your fingers through the crab meat to remove any bits of shell. In a bowl, combine the celery, onion, mayo, chili, hot sauce and Worcestershire. Add the crab meat to the bowl and mix with a fork. Season with salt and pepper, to your taste. 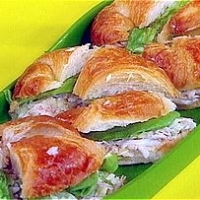 Pile salad on lettuce leaves in croissants. Cut each croissant in thirds on angles, following the shape of the pastry. Arrange sandwiches on a plate and serve. Sounds good. I'm surprised it's RR's since she doesn't like mayo! I will try. Thanks.